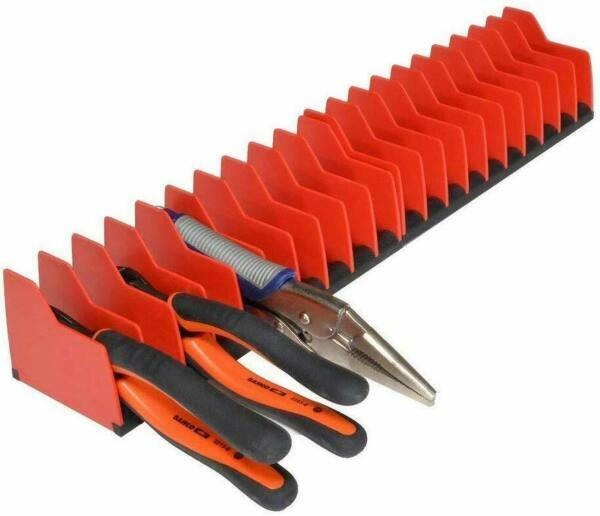 Maximize your storage by organizing pliers upright in toolbox drawers! The premium rubber base on this rack grips tools and the drawer to keep it all in place. With 7/8" wide slots, it accommodates a wide variety of tools holding a total of 10, even the spring opened pliers and ones with insulated handles. It provides you immediate recognition of missing tools and it is fuel & solvent resistant. Dimensions: L x W x H (in. ): 10 x 3.5 x 3. All 10 slots are 7/8" wide. It is proudly made in the USA and carries lifetime guarantee! The MLTOOLS 100% customer satisfaction guarantee means: We will fix any problem quickly to make happy customers! If you are not satisfied, please simply return it for full refund or a replacement.